This favor would also be ideal for a vintage, outdoor, or rustic wedding reception. The bags are neoprene totes which protect the wine bottle inside but on the outside they look like a rustic buralp tote. So much fun for a fall wedding! It would be great to set up a wine bar at the reception and let the guests take home a bottle of wine just like what was served at the reception. The bags have several designs so you can pick the one that suits your style. 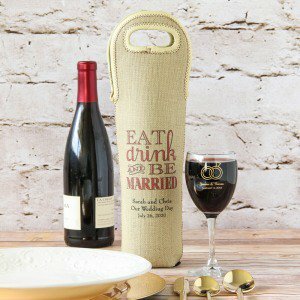 You can find these personalized wine totes here.